Repetitive stress injuries are no laughing matter. 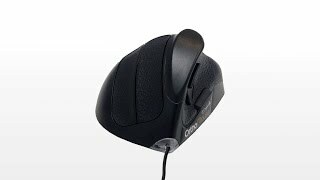 That's why the science behind the OrthoMouse Ergonomic Mouse by OrthoVia is so helpful when understanding why arm pronation happens in the first place. Designed by an orthopedic surgeon, the OrthoMouse is one accessory that seeks to minimize arm and wrist strain, allowing users to keep working comfortably until the job is done. My coworker let me borrow her orthomouse, as I was having extreme wrist, arm, and thumb pain from a standard cheap mouse. Within 2 days of using this mouse my pain was gone. However, no matter the combination of accessories, it is still too big for my hand. I have to change my hand position to go between clicking and scrolling. I wish it came in a smaller version. I am still on the hunt for a mouse that is ergonomic without a scroll wheel. Cons: Smallest accessories are still too big for my small hand. Wireless version lacks responsive. My wrist and arm curls were esquetando during working days. In some pies I even to work to put ice in mouse arm. After a month using the OrthoMouse never had to do this, I am really satisfied. I am small (5ft) and my hand is small even for someone my size. The best of the adapters is slightly too big for my hand, although the mouse is useable. I was looking for a way to scroll up and down without having to use my middle finger that has frequent "trigger" problems. This mouse is great in that respect. Scrolling with the thumb is simple and a breeze. It takes a few days to adapt completely to the mouse. I recommend the product. Unfortunately, I have small hands and no matter what configuration I use I can't get one that fits my hand comfortably. I have had this mouse for well over a year and it has helped tremendously. I have tried many others that were supposed to be ergonomic, but they did not help with the pain in my wrist. Between additional pieces that come with it which allow for precise size adjustment and the side thumb scroll capabilities, it is a great piece of hardware. I would definitely recommend it. Takes a little getting used to, but worked for me - my wrist pain is almost entirely gone. The OrthoMouse is Excellent. I've found using this product has significantly eased and helped eliminate my carpal tunnel symptons. I recommend it highly to anyone experiencing discomfort/pain in their daily computer use. The orthomouse was pretty easy to get used to. My hand is small so I was told to use the largest attachment. Sometimes I find my hand not exactly in the right spot on the mouse but my hand is not hurting any more. Unfortunately I use a computer at work and one at home and I only have the ortho mouse at work, so I am not getting the full benefit from using it. I would recommend it though. I am a professional technical writer, and I was having trouble with my shoulder, with pain starting there and referring down my arm. Now that I have the OrthoMouse, my hand and shoulder are pain free! $108.00 List Price: $119.95* The list price is the same as the MSRP (Manufacturer's Suggested Retail Price). It may not necessarily be the price at which the product is sold.